Adam Huntsman (1786-1849) is best remembered for being the “timber toe” lawyer who beat David Crockett for Congress in 1835, leading to his journey to Texas and heroic death at the Alamo. But there was much more to him than the outcome of one election. As a public servant, he prided himself on his independence and serving the interests of his constituents. “I am the partizan of no man,” he declared. “I never intended to be so.” It was that individualistic spirit which put him at odds with one of the most forceful personalities in American history—Andrew Jackson—and helped bring about the first two-party political system in Tennessee history.A Virginia native, Huntsman resided in all three grand divisions of the state, settling in Knoxville, Overton County, and Madison County. 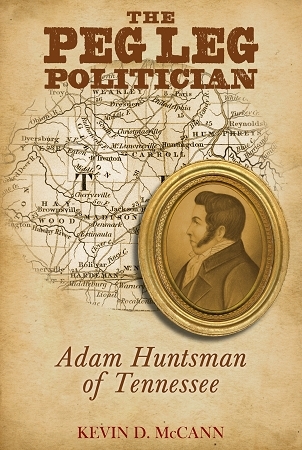 He served five terms in the state senate, one term in Congress, and was an influential member of the 1835 constitutional convention.Huntsman was among the most colorful personalities in antebellum Tennessee. Despite losing his leg, he never lost his sense of humor. It was an essential ingredient in his political writings and speeches, sprinkled with Biblical references and selections from Aesop’s Fables. It brought him personal popularity in courtrooms and on the campaign trail, where he never lost a race for public office.